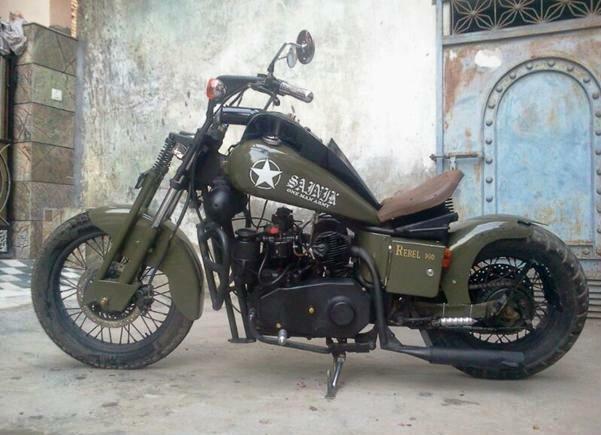 The Rebel Custom Diesel Motorcycle from India. Here, we are a small group working for diesel bike revolution in India and we are one and only in India customizing diesel bikes Rebel Custom Motorcycles. Find and support them on Facebook. Attaching pic of my most famous diesel model 7.5hp greaves engine, self-start motor, smoke precipitator, and a lot more. We put this bike on our Facebook page and it was the most popular ever! This bike started out as a stock factory Taurus, but is now a very different animal. 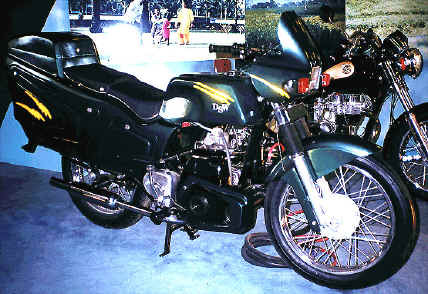 Barring the original Greaves power unit, almost everything else has been customised to suit long range touring in India. Between the Diesel and my RE 500, I have covered more than 80,000 kms on Indian roads and highways. The diesel is obviously my mount of choice when riding solo on account of the economy it delivers, and the fact that unlike the petrol 500, it's veritably water proof - a great virtue in the Indian monsoon. Here's a quick list of the custom stuff on the bike. 1: Wide reach 'flat' handlebars ( a good 8 inches wider than stock). Helps handle the forward weight of the bike when fully loaded. 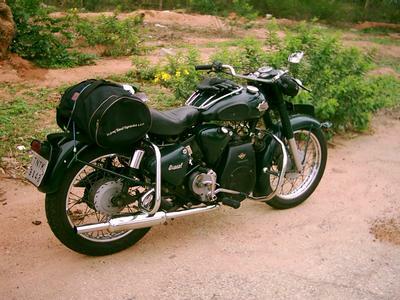 3: Sprung saddle - not in pic, but usually goes on for 1000km plus rides.Neutralises a lot of engine vibration. 5: Luggage roll bars. With over 20 kgs of stuff loaded, even a small drop can cause a big mess... hence the leg/luggage guards you see all over. 6: Saddle bags - not in picture. 7: Manual battery cutout. - Helps me control how much charge gets into the battery on a long day ride. 8: Auxiliary Riding lights - powered off a 9amp battery, 30 watts each, sourced off an old Bedford truck. 9: 18 tooth countershaft sprocket - adds 10kph to top cruising speed, HUGE virtue on this bike. Laser Cut Primary Chain case. 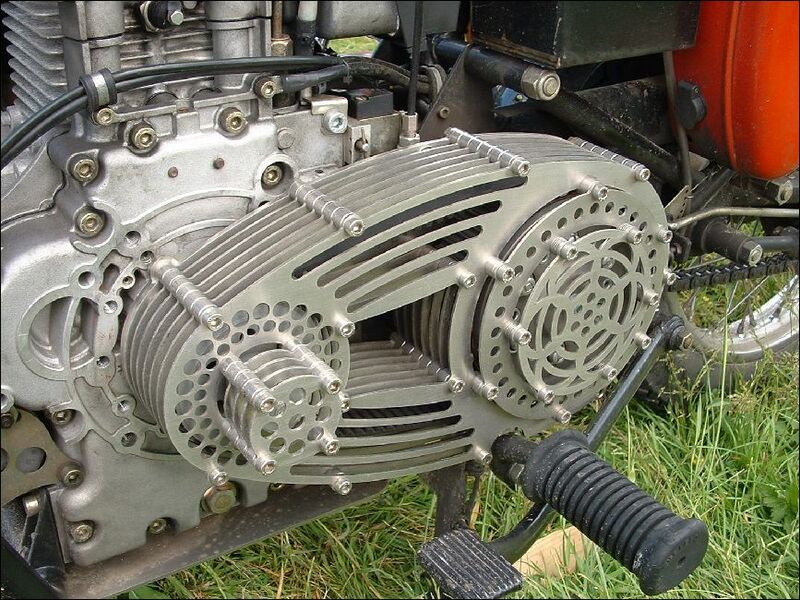 This amazing primary chain case cover was created by Peter Selzer for his Sommer Hatz Royal Enfield. I was this first at the Big Knock rally back on 2005. Check out the report here. 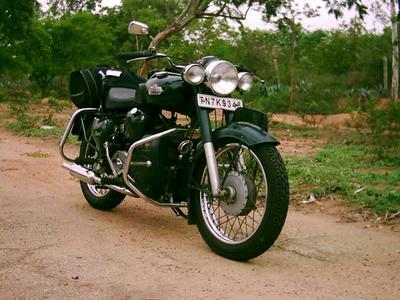 Royal Enfield 500cc Diesel Motorcycle. Well, I just found that a company, Kristi, were given the job of turning an existing Royal Enfield diesel motorcycle into a mobile workshop and tool carrier to service all sorts of vehicles out in the wilds. It certainly looks different from the standard bike but I've no way on confirming that engine is 500cc. It's probably one of the bigger engines in the 4400 plus range.